Why look at a boring white sink every morning and before you sleep. The design is very stylish and sleek. I ordered two and they look fabulous side by side with a single hole waterfall faucet. 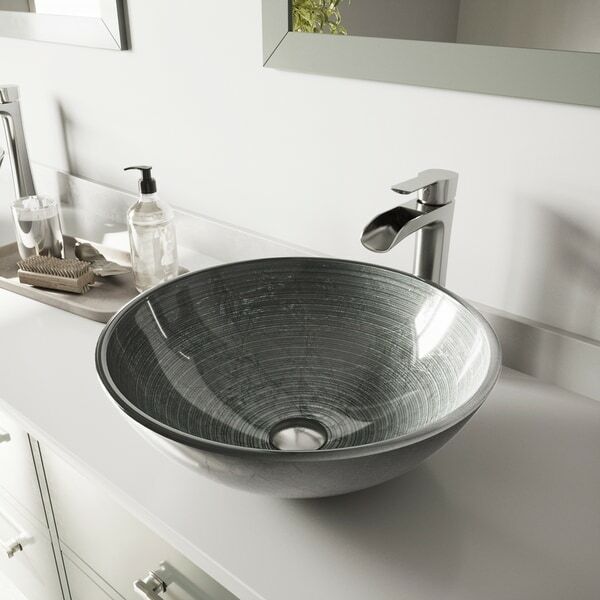 The touch of sparkle in the VIGO Simply Silver Glass Vessel Bathroom Sink is sure to brighten up any modern bathroom. Designed for durability, this handcrafted sink is constructed from solid tempered glass for maximum longevity. This all-in-one bathroom sink set features the cascading VIGO Niko Vessel Bathroom Faucet finished in brushed nickel, a pop-up drain in a matching finish and a mounting ring. The color is just gorgeous, It looks modern and elegant. The faucet and sink are perfect if you want to give your bathroom a modern and elegant look without spending so much. I put this set in guest bathroom and everyone loved it ! Really added some class to boring bathroom ! "Is this sink and faucet ADA compliant"
Not sure what you are asking. I ordered this and it is beautiful. I have not installed yet due to waiting on the vanity top to come in. 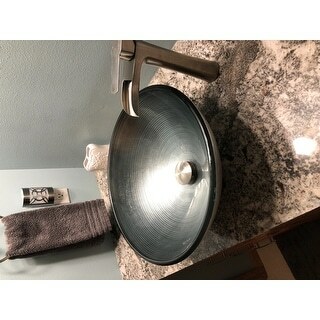 I can say where i ordered the vanity top (well known American home improvement store) the employee stated that VIGO is one of the best on the market. I plan to post pics and give a thorough opinion once i have it all together.